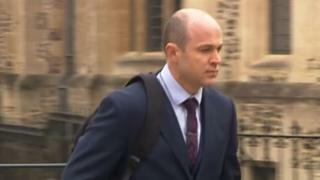 An Army sergeant who was having two affairs tampered with his wife's parachute to try and kill her, a court has heard.Emile Cilliers, 38, of the Royal Army Physical Training Corps, faces two charges of attempted murder.A retrial at Winchester Crown Court heard Mr Cilliers held his wife Victoria "in contempt" and "wanted to get rid of her permanently".Mr Cilliers denies all the charges against him.Victoria Cilliers was seriously injured when her main and reserve parachutes failed during a jump at the Army Parachute Association at Netheravon, Wiltshire, on Easter Sunday, 5 April 2015. The court heard the victim was a "highly experienced parachutist and parachute instructor. Prosecutor, Michael Bowes QC, said: "When she jumped out of the plane at 4,000ft, both her main parachute and her reserve parachute failed, causing her to spiral to the ground. "Those attending the scene expected to find her dead. "Although she was badly injured, almost miraculously she survived that fall. "He said that soon after she landed on the ground, people at the scene realised vital pieces of kit were missing.